The traffic cop who was on his way to work, noticed the toddler in the middle of the street when he jumped in to his rescue. 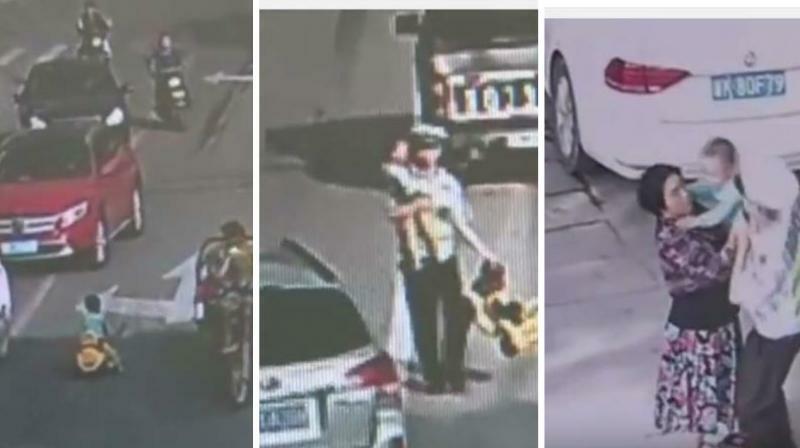 Lishui, Zhejiang: A CCTV surveillance of a busy street in China's Zhejiang province captured an incredible moment when a toddler made his way to a street bustling with vehicles, putting his life in danger, when a brave cop stepped in and brought the kid back to safety. The video footage shows a toddler driving his toy car in the middle of the road, during the rush hour. The kid can be seen narrowly missing on vehicles coming towards him. However, a vigilant traffic cop comes to his rescue. The traffic cop who was on his way to work, noticed the toddler in the middle of the street when he jumped in to his rescue, averting a major tragedy. "It was very dangerous with many big vehicles around him, so without a second thought I rushed to the kid immediately and took him to the side of the road," officer Wu Feng was quoted as saying. The video clip ends with the cop handing over the little one to his mother, who would forever be grateful to him.